A browser war is competition for dominance in the usage share of web browsers. The "First Browser War" during the late 1990s pitted Microsoft's Internet Explorer against Netscape's Navigator. Browser wars continued with the decline of Internet Explorer's market share and the popularity of other browsers including Firefox, Google Chrome, Safari, and Opera. With the introduction of HTML5 and CSS 3, a new generation of browser war began, this time adding extensive client-side scripting to the World Wide Web, as well as more widespread use of smartphones and other mobile devices for browsing the web. These newcomers have ensured that browser battles continue among enthusiasts, while the average web user is less affected. The World Wide Web is an Internet-based hypertext system invented in the late 1980s and early 1990s by Tim Berners-Lee. Berners-Lee wrote the first web browser WorldWideWeb, later renamed Nexus, and released it for the NeXTstep platform in 1991. By the end of 1992 other browsers had appeared, many of them based on the libwww library. These included Unix browsers such as Line Mode Browser, ViolaWWW, Erwise, and MidasWWW, and MacWWW/Samba for the Mac. Even though these browsers tended to be simple HTML viewers, relying on external helper applications to view multimedia content, they provided choice to users both in browsers and platforms. Further browsers were released in 1993, including Cello, Arena, Lynx, tkWWW, and Mosaic. The most influential of these was Mosaic, a multiplatform browser developed at National Center for Supercomputing Applications (NCSA). By October 1994, Mosaic was "well on its way to becoming the world's standard interface", according to Gary Wolfe of Wired. Several companies licensed Mosaic to create their own commercial browsers, such as AirMosaic and Spyglass Mosaic. One of the Mosaic developers, Marc Andreessen, co-founded the Mosaic Communications Corporation and created a new web browser named Mosaic Netscape. There are two ages of the Internet—before Mosaic, and after. The combination of Tim Berners-Lee's Web protocols, which provided connectivity, and Marc Andreesen's browser, which provided a great interface, proved explosive. In twenty-four months, the Web has gone from being unknown to absolutely ubiquitous. To resolve legal issues with NCSA, the company was renamed Netscape Communications Corporation and the browser Netscape Navigator. The Netscape browser improved on Mosaic's usability and reliability and was able to display pages as they loaded. By 1995, helped by the fact that it was free for non-commercial use, the browser dominated the emerging World Wide Web. Other browsers launched during 1994 included IBM Web Explorer, Navipress, SlipKnot, MacWeb, and Browse. In 1995, Netscape faced new competition from OmniWeb, WebRouser, UdiWWW, and Microsoft's Internet Explorer 1.0, but continued to dominate the market. Market share for several browsers between 1995 and 2010. Firefox was originally named "Phoenix", a name which implied that it would rise like a Phoenix after Netscape Navigator was killed off by Microsoft. By mid-1995 the World Wide Web had received a great deal of attention in popular culture and the mass media. Netscape Navigator was the most widely used web browser and Microsoft had licensed Mosaic to create Internet Explorer 1.0, which it had released as part of the Microsoft Windows 95 Plus! pack in August. Internet Explorer 2.0 was released as a free download three months later. Unlike Netscape Navigator, it was available to all Windows users free of charge, this also applying to commercial companies. Other companies later followed suit and released their browsers free of charge. Both Netscape Navigator and competitor products like InternetWorks, Quarterdeck Browser, InterAp, and WinTapestry were bundled with other applications to full Internet suites. New versions of Internet Explorer and Netscape (branded as Netscape Communicator) were released at a rapid pace over the following few years. Internet Explorer began to approach feature parity with Netscape with version 3.0 (1996), which offered scripting support and the market's first commercial Cascading Style Sheets (CSS) implementation. In October 1997, Internet Explorer 4.0 was released. The release party in San Francisco featured a ten-foot-tall letter "e" logo. Netscape employees showing up to work the following morning found the logo on their front lawn, with a sign attached that read "From the IE team ...We Love You" The Netscape employees promptly knocked it over and set a giant figure of their Mozilla dinosaur mascot atop it, holding a sign reading "Netscape 72, Microsoft 18" representing the market distribution. Internet Explorer 4 changed the tides of the browser wars. It was integrated into Microsoft Windows, which gave it a large installation base. During these releases, it was common for web designers to display 'best viewed in Netscape' or 'best viewed in Internet Explorer' logos. These images often identified a specific browser version and were commonly linked to a source from which the stated browser could be downloaded. These logos generally recognized the divergence between the standards supported by the browsers and signified which browser was used for testing the pages. In response, supporters of the principle that web sites should be compliant with World Wide Web Consortium standards and hence viewable with any browser started the "Viewable With Any Browser" campaign, which employed its own logo similar to the partisan ones. Most mainstream web sites, however, specified one of Netscape or IE as their preferred browser while making some attempt to support minimal functionality on the other. Microsoft had three strong advantages in the browser wars. One was resources: Netscape began with about 80% market share and a good deal of public goodwill, but as a relatively small company deriving the great bulk of its income from what was essentially a single product (Navigator and its derivatives), it was financially vulnerable. Netscape's total revenue never exceeded the interest income generated by Microsoft's funds that were readily available for use. Microsoft's resources allowed them to make Internet Explorer available without charge, as the revenues from Windows were used to fund its development and marketing. Netscape was commercial software for businesses, but was provided free for home and educational use; Internet Explorer was provided free for all Windows and Macintosh users, cutting off a significant revenue stream; as it was told by Jim Barksdale, President and CEO of Netscape Communications: "Very few times in warfare have smaller forces overtaken bigger forces...". Another advantage was that Microsoft Windows had over 90% share of the desktop operating system market. Internet Explorer was bundled with every copy of Windows, therefore Microsoft was able to obtain an advantage the market share more easily than Netscape, as customers had Internet Explorer as the default browser. In this time period, many new computer purchases were first computer purchases for home users or offices, and many of the users had never extensively used a web browser before. Consequently, the buyer did not have anything else to compare with and little motivation to consider alternatives; the set of abilities they had gained with access to the Internet and the World Wide Web made any difference in browser features or ergonomics pale in comparison. During the United States Microsoft antitrust case in 1998, government witness and Intel vice president Steven McGeady testified that a senior executive at Microsoft told him in 1995 of his company's intention to "cut off Netscape's air supply", although a Microsoft attorney rejected McGeady's testimony as not credible. That same year, Netscape, the company, was acquired by America Online for US$4.2 billion. Internet Explorer became the new dominant browser, attaining a peak of about 96% of the web browser usage share during 2002. The first browser war ended with Internet Explorer having no remaining serious competition for its market share. This also brought an end to the rapid innovation in web browsers; until 2006 there was only one new version of Internet Explorer since version 6.0 had been released in 2001. Internet Explorer 6.0 Service Pack 1 was developed as part of Windows XP Service Pack 1 and was also integrated into Windows Server 2003. Further enhancements were made to Internet Explorer in Windows XP Service Pack 2 (released in 2004), including a pop-up blocker and stronger default security settings regarding the installation of ActiveX controls. 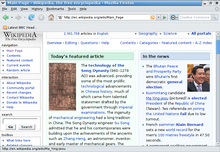 Firefox 2.0, shown here, was released in October 2006. At the start of Netscape Navigator's decline, Netscape open-sourced their browser code, and later entrusted it to the newly formed non-profit Mozilla Foundation—a primarily community-driven project to create a successor to Netscape. Development continued for several years with little widespread adoption until a stripped-down browser-only version of the full suite, which included new features such as a separate search bar (which had previously only appeared in the Opera browser), was created. The browser-only version was initially named Phoenix, but because of trademark issues that name was changed, first to Firebird, then to Firefox. This browser became the focus of the Mozilla Foundation's development efforts and Mozilla Firefox 1.0 was released on November 9, 2004. It then continued to gain an increasing share of the browser market until a peak in 2010. In 2003, Microsoft announced that Internet Explorer 6 Service Pack 1 would be the last standalone version of its browser. Future enhancements would be dependent on Windows Vista, which would include new tools such as the WPF and XAML to enable developers to build web applications. In response, in April 2004, the Mozilla Foundation and Opera Software joined efforts to develop new open technology standards which add more capability while remaining backward-compatible with existing technologies. The result of this collaboration was the WHATWG, a working group devoted to the fast creation of new standard definitions that would be submitted to the W3C for approval. The growing number of device/browser combinations in use, legally-mandated web accessibility, as well as the expansion of expected web functionality to essentially require DOM and scripting abilities, including AJAX, made web standards of increasing importance during this era. Instead of touting their proprietary extensions, browser developers began to market their software based on how closely it adhered to the behavior as specified by the standard. On February 15, 2005, Microsoft announced that Internet Explorer 7 would be available for Windows XP SP2 and later versions of Windows by mid-2005. The announcement introduced the new version of the browser as a major upgrade over Internet Explorer 6 SP1. Opera had been a long-time small player in the browser wars, known for introducing innovative features such as tabbed browsing and mouse gestures, as well as being lightweight but feature-rich. The software, however, was commercial, which hampered its adoption compared to its free rivals until 2005, when the browser became freeware. On June 20, 2006, Opera Software released Opera 9 including an integrated source viewer, a BitTorrent client implementation, and widgets. It was the first Windows browser to pass the Acid2 test. Opera Mini, a mobile browser, has significant mobile market share. Editions of Opera are also available for the Nintendo DS and the Wii. Microsoft released Internet Explorer 7 on October 18, 2006. It included tabbed browsing, a search bar, a phishing filter, and improved support for web standards (including full support for PNG)—all features already long familiar to Opera and Firefox users. Microsoft distributed Internet Explorer 7 to genuine Windows users (WGA) as a high-priority update through Windows Update. Typical market share analysis showed only a slow uptake of Internet Explorer 7 and Microsoft decided to drop the requirement for WGA and made Internet Explorer 7 available to all Windows users in October 2007. Throughout the two following years, Microsoft worked on Internet Explorer 8. On December 19, 2007, the company announced that an internal build of that version had passed the Acid2 CSS test in "IE8 standards mode"—the last of the major browsers to do so. Internet Explorer 8 was released on March 19, 2009. New features included accelerators, improved privacy protection, a compatibility mode for pages designed for older browsers, and improved support for various web standards. It was the last version of Internet Explorer to be released for Windows XP. Internet Explorer 8 scored 20/100 in the Acid3 test, which was much worse than all major competitors at the time. On October 24, 2006, Mozilla released Mozilla Firefox 2.0. It included the ability to reopen recently closed tabs, a session restore feature to resume work where it had been left after a crash, a phishing filter, and a spell-checker for text fields. Mozilla released Firefox 3.0 on June 17, 2008, with performance improvements and other new features. Firefox 3.5 followed on June 30, 2009, with further performance improvements, native integration of audio and video, and more privacy features. On December 28, 2007, Netscape announced that support for its Mozilla-derived Netscape Navigator would be discontinued on February 1, 2008, suggesting its users migrate to Mozilla Firefox. However, on January 28, 2008, Netscape announced that support would be extended to March 1, 2008, and mentioned Flock alongside Firefox as alternatives to its users. During December 2009 and January 2010, StatCounter reported that its statistics indicated that Firefox 3.5 was the most popular browser when counting individual browser versions, passing Internet Explorer 7 and 8 by a small margin. This was the first time a global statistic has reported that a non-Internet Explorer browser version had exceeded the top Internet Explorer version in usage share since the fall of Netscape Navigator. However, this feat, which GeekSmack called the "dethroning of Microsoft and its Internet Explorer 7 browser," could largely be attributed to the fact that it came at a time when version 8 was replacing version 7 as the dominant Internet Explorer version; no more than two months later Internet Explorer 8 had established itself as the most popular browser and version, a position which it still held as of March 2011. Other major statistics, such as Net Applications, never reported any non-Internet Explorer browser having a higher usage share than Internet Explorer if each version of each browser was looked at individually: for example Firefox 3.5 was reported as the third most popular browser version from December 2009 to February 2010 and seceded by Firefox 3.6 since April 2010, each ahead of Internet Explorer 7 but behind Internet Explorer 6 and 8. In October 2010, StatCounter reported that Internet Explorer had for the first time dropped below 50% market share to 49.87% in their figures. Also, StatCounter reported Internet Explorer 8's first drop in usage share in the same month. Google released Google Chrome 9 on February 3, 2011. New features introduced included support for WebGL, Chrome Instant, and the Chrome Web Store. The company created another seven versions of Chrome that year, finishing with Chrome 16 on December 15, 2011. Google Chrome 17 was released on February 15, 2012. In April 2012, Google browsers (Chrome and Android) became the most used browsers on Wikimedia Foundation sites. By May 21, 2012, StatCounter reported Chrome narrowly overtaking Internet Explorer as the most used browser in the world. However, troughs and peaks in the market share between Internet Explorer and Chrome meant that Internet Explorer was slightly ahead of Chrome on weekdays up until July 4. At the same time, Net Applications reported Internet Explorer firmly in first place, with Google Chrome almost overtaking Firefox as the second. In 2012, responding to Chrome's popularity, Apple discontinued Safari for Windows. Microsoft released Internet Explorer 9 on March 14, 2011. It featured a revamped interface, support for the basic SVG feature set, and partial HTML5 video support, among other new features. It only runs on Windows Vista, Windows 7, and Windows Phone 7. The company later released Internet Explorer 10 along with Windows 8 and Windows Phone 8 in 2012, and an update compatible with Windows 7 followed in 2013. This version drops Vista and Phone 7 support. The release preview of Internet Explorer 11 was released on September 17, 2013. It supports the same desktops as its predecessor. The concept of rapid releases established by Google Chrome prompted Mozilla to do the same for its Firefox browser. On June 21, 2011, Firefox 5.0 was the first rapid release for this browser, finished a mere six weeks after the previous edition. Mozilla created four more whole-number versions throughout the year, finishing with Firefox 9 on December 20, 2011. For those desiring long term support, Mozilla made an Extended Support Release (ESR) version of Firefox 10 on January 31, 2012. Contrary to the regular version, a Firefox ESR receives regular security updates plus occasional new features and performance updates for approximately one year, after which a 12-week grace period is given before discontinuing that version number. Those who continued to use the rapid releases with an active Internet connection were automatically updated to Firefox 11 on March 15, 2012. By the end of 2011 however Chrome overtook Firefox to become world's most used browser, and the competition between Chrome and Firefox intensified. During this era, all major web browsers implemented support for HTML5 video. Supported codecs, however, varied from browser to browser. Current versions of Android, Chrome, and Firefox support Theora, H.264, and the VP8 version of WebM. Older versions of Firefox omitted H.264 due to it being a proprietary codec, but it was made available beginning in version 17 for Android and version 20 for Windows. Internet Explorer and Safari support H.264 exclusively,[when?] but the Theora and VP8 codecs can be manually installed on the desktop versions. Given the popularity of WebKit for mobile browsers, Opera Software discontinued its own Presto engine in February 2013. The Opera 12 series of browsers were the last to use Presto with its successors using WebKit instead. In 2015, Microsoft discontinued production of newer versions of Internet Explorer. By this point Chrome overtook all other browsers as the browser with the highest usage share. Starting in 2015 with the release of Windows 10, Microsoft shifted from Internet Explorer to Microsoft Edge. However the new browser has failed to capture much popularity as of 2018. By 2017 usage shares of Opera, Firefox and Internet Explorer fell well below 5% each, while Google Chrome had expanded to over 60% worldwide. On May 26, 2017 Andreas Gal, former Mozilla CTO publicly stated that Google Chrome won the Second Browser War. Though Internet Explorer is no longer the default browser of Microsoft as of Windows 10, it continues to operate due to organizations needing it for legacy applications, and despite its overall decline has a higher usage share than its unpopular successor Microsoft Edge. Due to Google Chrome's success in December 2018 Microsoft announced that they would be building a new version of Edge powered by Google's rendering engine, Chromium, rather than their own rendering engine, EdgeHTML. The development was in progress as of 2019. Though Firefox showed a slight increase in usage share as of February 2019, it continues to struggle with less than 10% usage share worldwide. ^ "Browser Market Share Worldwide - July 2017". Statcounter. July 2017. Retrieved 2017-08-02. ^ "Browser Market Share Worldwide - December 2018". Statcounter. December 2018. Retrieved 2019-01-11. ^ a b Swartz, Jon; Writer, Chronicle Staff (1997-10-02). "Microsoft Pulls Prank / Company takes browser war to Netscape's lawn". SFGate. Retrieved 2019-01-12. ^ "Did the browser wars finally end in 2014?". Over the past decade, a lot has changed: Mobile devices now outnumber traditional PCs, and the desktop browser has become much less important than mobile web clients and apps. Apple's mobile Safari and Google's Chrome are now major players, Mozilla is in a time of major transition, and Microsoft is still paying for its past sins with Internet Explorer. And in 2014, all those players seem to have dug in to well-entrenched positions. ^ Wolfe, Gary (October 1994). "The (Second Phase of the) Revolution Has Begun". Wired Magazine. Retrieved 2012-04-24. ^ Pesce, Mark (October 15, 1995). "A Brief History of Cyberspace". ZDNet. Archived from the original on 2008-10-14. Retrieved February 6, 2015. ^ Berghel, Hal (2 April 1996). "Hal Berghel's Cybernautica". Retrieved 14 November 2010. ^ Elstrom, Peter (22 January 1997). "MICROSOFT'S $8 MILLION GOODBYE TO SPYGLASS". Bloomberg Businessweek. Archived from the original on 29 June 1997. Retrieved 9 February 2011. ^ Thurrott, Paul (22 January 1997). "Microsoft and Spyglass kiss and make up". WindowsITPro. Retrieved 9 February 2011. ^ "Windows History: Internet Explorer History". Microsoft.com. 2003-06-30. Retrieved 2009-11-11. ^ "Microsoft Internet Explorer Web Browser Available on All Major Platforms, Offers Broadest International Support" (Press release). Microsoft. 30 April 1996. Retrieved 7 November 2014. ^ a b Berst, Jesse (20 February 1995). "Web-Wars". PC Week. Archived from the original on 18 July 2011. Retrieved 25 February 2011. ^ "Mozilla stomps IE". Home.snafu.de. 1997-10-02. Retrieved 2009-11-11. ^ "Roads and Crossroads of the Internet History". NetValley.com. Retrieved 2011-02-14. ^ Chandrasekaran, Rajiv (November 1998). "Microsoft Attacks Credibility of Intel Exec". Washington Post. Retrieved 2009-12-01. ^ "Position Paper for the W3C Workshop on Web Applications and Compound Documents". W3.org. Retrieved 2009-11-11. ^ "The Business Benefits of Web Standards". In such an increasingly heterogeneous environment, testing each web page in every configuration is impossible. Coding to standards is then the only practical solution. ^ "IEBlog : IE7". Blogs.msdn.com. 2005-02-15. Retrieved 2009-11-11. ^ Evers, Joris. "Microsoft tags IE 7 'high priority' update | CNET News.com". News.com.com. Retrieved 2009-11-11. ^ "IEBlog: Internet Explorer 7 Update". Blogs.msdn.com. Retrieved 2009-11-11. ^ "Window Internet Explorer 8 Fact Sheet" (Press release). Microsoft. March 2009. Retrieved 26 August 2010. ^ Presto and WebKit-based browsers scored 100 in 2008, with Firefox scoring 93 in June 2009. ^ "Coming Tuesday, June 17th: Firefox 3". Mozilla Developer Center. Retrieved 2009-10-12. ^ "Mozilla Advances the Web with Firefox 3.5". Mozilla Europe and Mozilla Foundation. Retrieved 2009-10-12. ^ KDE KFM-Devel mailing list "(fwd) Greetings from the Safari team at Apple Computer", January 7, 2003. ^ "Web Content Accessibility and Mobile Web: Making a Website Accessible Both for People with Disabilities and for Mobile Devices". W3C. Retrieved 2012-08-31. ^ "Mobile Product Accessibility Testing Resources". Digital.gov. Retrieved 2013-07-31. ^ "When it comes to accessibility, Apple continues to lead in awareness and innovation". TechCrunch. Retrieved 2016-05-19. ^ "The Netscape Blog". Netscape, AOL. Retrieved 2007-12-28. ^ "Browser market share". Net Applications. December 30, 2009. Retrieved 2009-12-30. ^ Firefox 3.5 is world's most popular browser, StatCounter says, Nick Eaton. seattlepi blogs. 2009-12-21. Retrieved 2009-12-22. ^ "StatCounter global stats – Top 12 browser versions". StatCounter. Retrieved 12 March 2010. ^ "Firefox 3.5 surpasses IE7 market share". Geeksmack.net. 2009-12-22. Archived from the original on 2010-05-26. Retrieved 2010-05-23. ^ "Browser market share trend". Marketshare.hitslink.com. Retrieved 2010-06-25. ^ "Mozilla Firefox 3.6 Release Notes". Mozilla.com. 2010-01-21. Retrieved 2010-05-23. ^ "Microsoft Internet Explorer browser falls below 50% of worldwide market for first time". StatCounter. Retrieved 7 October 2010. ^ "StatCounter Browser Versions form Oct 09 to Oct 10". StatCounter. Retrieved 9 November 2010. ^ "Google Chrome Blog". chrome.blogspot.com. 2011-02-03. Retrieved 2010-02-04. ^ "Wikimedia Traffic Analysis Report - Browsers e.a." Wikimedia Foundation. Retrieved 22 May 2012. ^ "Google Chrome Overtakes Internet Explorer". Retrieved 23 July 2016. ^ "StatCounter Global Stats - Browser, OS, Search Engine including Mobile Usage Share". Retrieved 23 July 2016. ^ "Browser market share". Netmarketshare.com. Retrieved 2017-04-25. ^ "Apple Discontinues Safari Development for Windows". ^ "Rapidity | Future Releases". Blog.mozilla.org. 2011-08-26. Retrieved 2017-04-25. ^ "Chrome Overtakes Firefox Globally for First Time". StatCounter Global Stats. Retrieved 2019-02-28. ^ "Microsoft To Discontinue Internet Explorer, To Launch New Browser For Windows 10". International Business Times AU. 2015-03-18. Retrieved 2019-02-28. ^ Finley, Klint (2016-01-12). "The Days of Microsoft Internet Explorer Are Numbered—But Its Sorry Legacy Will Live On". Wired. ISSN 1059-1028. Retrieved 2019-02-28. ^ Bott, Ed. "Browser wars 2018: Microsoft Edge falls behind ... Internet Explorer?". ZDNet. Retrieved 2019-01-28. ^ Andreas (2017-05-25). "Chrome won". Andreas Gal. Retrieved 2019-02-28. ^ "Opera web browser targets enhanced accessibility with major redesign". Retrieved 2019-02-28. ^ "Microsoft Chromium browser: Everything you need to know". Retrieved 2019-02-28. ^ Warren, Tom (2019-02-19). "Microsoft's new Chrome extension lets you resume browsing across Windows 10 devices". The Verge. Retrieved 2019-02-28. ^ Keizer, Gregg (2019-02-01). "Top web browsers 2019: Firefox scores second straight month of share growth". Computerworld. Retrieved 2019-02-28.